Hello, today I want to talk about one of my favorite hair style: the Donut bun. It is one of my favorite for several reasons. 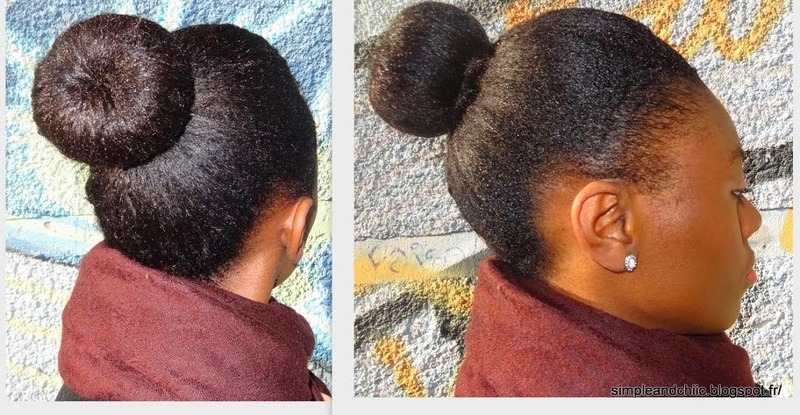 Number one you can wear it for several occasions, number two it is really easy and quick to do, number three your hair don't need to be super long to obtain a nice full bun. It is an easy hair style to do but you still need a few accessories that may vary depending on your own hair. There is one thing that will remain the same for everyone; the actual Donut Bun (n°5). You can buy this in supermarkets or in stores specialised on hair accessories. I bought mine at Claire's for less than £5 but you can also make it yourself with the help of a socket. You can find many tutorials on the web. I don't like the texture of this tool, it is too rough for me so I always use a Satin socket (n°4) to make the texture smooth. I cut one side of the socket and wrap the piece I get around the Donut bun (picture below). I then do a simple ponytail and place the bun around it. I distribute my hair around the Donut Bun and place my rubber band around the all thing (n°3 below). Because my hair was frizzy around the perimeter I damped that part, applied my "curl defining cream" (n°1) and put my satin scarf around my hair until it got dry in order to tame the frizz. I used the bobby pins (n°6) to tuck in the hair that was left out. As you can see above my hair was looking crazy before the bun (n°1), but I did not even use a comb, I was way too lazy and did not want to detangle my hair. I just needed a quick, easy and nice hair style and here it is ! love your edges mine are still trying to grow back. Thank you ! I have also had my issues with my edges. Last year I realized that they were thinning although I was very carefull with tight styles, relaxer etc... A month ago only I realized that my efges were thinning out because of my satin bonnet. I stopped using it a month ago only and my edges are finnally growing back !